Halfway the nineties Heather Nova was a star among the generation of alternative music lovers at that time. With her typical high vocals and sultry gaze she was a popular artist. She played all the big stages of every festival and was especially successful with the albums Oyster and Siren. After that the lady from Bermuda continued making albums, but could never really match her former success. Slowly she disappeared from the spotlights. 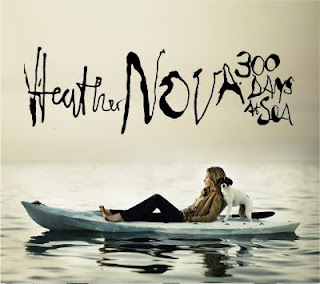 Now here's 300 Days At Sea, a record with a story. As a child she travelled on a boat for a while with her parents. But after her dad wasn't capable of sailing it any more it was sold. Later on it eventually sank to the bottom of the sea. A fisherman, at the same time fan of Heather, dived to the wreck and brought back the compass. At long last he was able to give it back to her. This reminded her of the three hundred days at sea. She got inspired by that and wrote the songs for this album. She gathered the old band from her successfull period and recorded the record in her own house. The result is an album that goes back to her sound of those successful nineties. Dreamy music with the well-known high pitch voice of Heather. The first single 'Higher Ground' is a fine exampled of a typical Heather Nova song when she's at her best. Like a boat on a calm sea it is floating along and slowly unfolds itself in the chorus. Sometimes the songs are tiny and modest ('Everything Changes'), other times more exuberant ('See A Little Piece Of Tomorrow'). But always tasteful, full of emotion and melancholia. Especially in these songs, the fairy-like ballads, she excels. And this album is full of it like in the beautiful 'The Good Ship Moon'. The lyrics are mostly poetic and of course she uses many metaphors and references to life at sea. Heather Nova is finally showing her best side again. This album can easily join her most successful albums. If she can truly revive the glory days is doubtful. The musical landscape has changed too significantly. She probably isn't interested in that herself anyway. In the end she's an artist at heart who wants to deliver the best. And she succeeded.